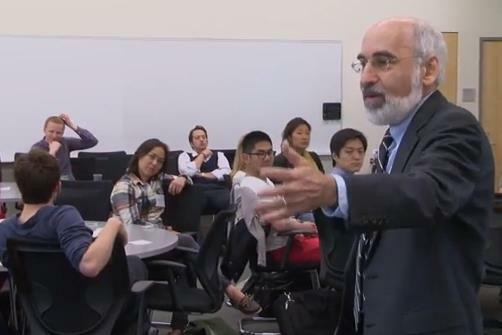 Led in this instance by MIT professor and Climate Interactive team member John Sterman, World Climate is simple to play–you can download all the materials for free on our website–and gives participants a very accurate glimpse into the issues facing U.N. climate change negotiations. Participants are broken into six different blocs–the U.S., the EU, other developed countries, China, India and other developing countries–and are tasked with crafting proposals to cap global warming at 2 degrees Celsius above pre-industrial levels by 2100. Participants must agree to a timeline in which they will cap carbon emissions and eventually reduce them. They must also agree to a rate of emissions reductions and can add additional measures such as increasing net forestation. And, of course, they hope to do all this within their own financial means. With each round of negotiations, the simulation leader–or “Secretary General”–plugs country commitments into our C-ROADS simulator to see the environmental impact of commitments in real time. Most groups will be surprised to see how difficult it is to curb the current rate of climate change, and in this simulation, many of the less-elevated countries found themselves underwater. But as the true costs of climate change became more and more apparent, participants were more and more willing to negotiate their terms. It is our conviction that generating this type of consciousness at the workplace or in the classroom is the first step toward generating successful climate change policies in the real world. -Delayed Response Time: Unfortunately, the planet doesn’t know or care that we’re in climate negotiations, and it’s not going to put biogeochemical reactions on hold until we figure it out. If, for example, we were to permanently shut down all carbon-emitting plants and vehicles today, the atmosphere wouldn’t be free of greenhouse gasses tomorrow. There are significant time delays between our actions and the reactions of the world’s climate. Add to this the delay between our decisions and our actions, and all of a sudden the future seems much more imminent. -The Role of Developing Countries: It’s difficult to ask those with less to do more. This may seem especially unfair in the context of climate change negotiations, since the most developed countries have also historically been the largest contributors to the problem. But the realities of global warming suggest that this may be the only way forward–even if all developed countries cut their emissions to zero, the world still couldn’t achieve the 2-degree goal. The projected growth of developing nations is simply too huge to ignore in the context of global climate change negotiations. -The Role of Developed Countries: We live in a world where reducing one’s environmental impact is expensive, and while technological advancements are reducing this price more and more, this will be the state of our world for some time. Therefore, while it’s true that everyone needs to scale back their carbon footprint now, this doesn’t mean that everyone can. This is going to require a massive financial commitment from wealthier countries–and at first, this may be more than some of them are comfortable giving. But as we see in this exercise, in the long run, the cost of doing nothing far outweighs the price tag of the investment necessary today. If you thought this run was interesting, take a look at other World Climate simulations. You can download all the materials you need to play World Climate on our website. Materials are available in English, Spanish, French, German and Mandarin Chinese. Don’t forget to download C-ROADS here.